ABSi is an ideal material for conceptual modeling, functional prototyping and direct digital manufacturing. Its strength is superior to standard ABS, and the translucent nature of ABSi is beneficial for monitoring material flow and light transmission, most commonly used for medical and automotive applications. FDM parts are dimensionally accurate, durable and hold their shape over time. The ABSi is available on the Fortus 400 and 900, in three different colors: translucent natural, translucent amber and translucent red and all the print resolutions available .005”, .007”, .010” and .013”. 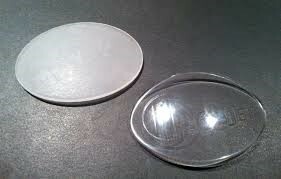 To clarify, translucent means that you can see thru the material, but the material is not clear like glass. This transparent PolyJet photopolymer offers strength, stiffness, elongation and impact resistance, plus it has the ability to blend with other materials for a range of opacities, hues and hardnesses. VeroClear enables visualization of internal components and features, and simulation of glass ideal for form and fit testing of see-through parts. Since the material is UV cured, exposing it to long-term UV light, basically using it outside, the material will degrade over time. There are some steps that you can take to reduce the breakdown on the material, but if you are planning on using VeroClear outside, it needs to be for shorter periods of time, like days and not months or use ABSi if possible. One of the aspects to consider is that the VeroClear parts do not come directly off the printer transparent. As you can see in the image below, the part has some “cloudiness” to it and has to be post-processed if you want the part to see-through. The post-processing involves, sanding, polishing and probably a coat of clear coat as well; so basically the same process that someone would take to clear up a hazy automobile headlight. Need more assistance in picking the right material? Download our 3D Printing Material Guide!